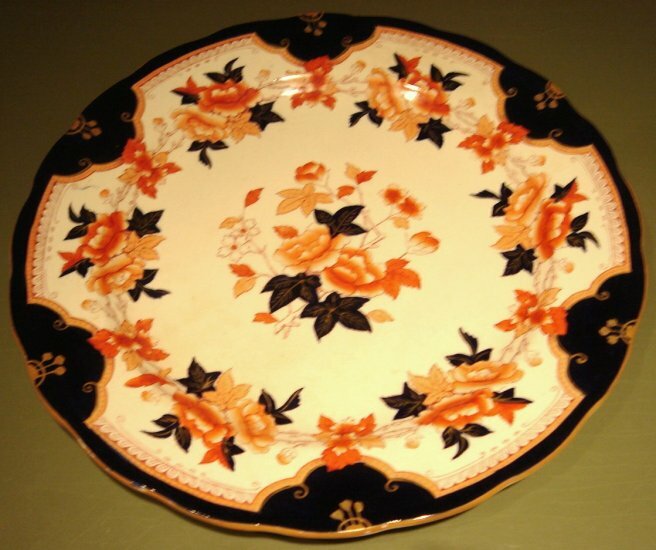 This early 20C English Imari porcelain plate is a great cabinet piece. It was purchased from the estate of a Nashville porcelain and glass collector. The cobalt blue border and leaves are hand painted. The floral on cream pattern is transfer print with hand highlights. The edge is scalloped. There are some numbers and a maker's mark under the glaze that I cannot decipher. It has fine crazing and some very faint mottling that comes with age. 10 5/8" diameter. I have 9 of these plates available. They will be listed singly because of their individual characteristics. See how beautifully they display in my Welsh dresser! FREE US shipping. Shipping charge quoted is for insurance only. Don't forget to bookmark my ecrater website!